Johannes Christian "Hans" Pflügler (born 27 March 1960) is a retired German footballer. He could either appear as a left or central defender, and played solely for Bayern Munich, winning eight major titles with the club and appearing in nearly 400 official games. Pflügler represented Germany at the 1990 World Cup and Euro 1988, winning the former tournament. 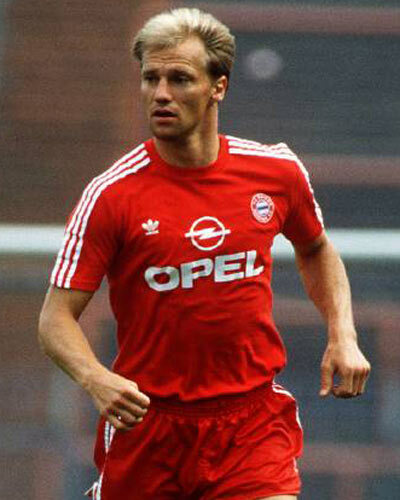 Born in Freising, Bavaria, Pflügler made his professional debuts in 1981–82, with the only club he ever knew, local and national giants FC Bayern Munich. After two experimental seasons, he became an automatic first-choice, also netting 27 Bundesliga goals from 1983–88 combined, and appearing in all the games and minutes in the 1986–87 European Cup, as Bayern finally finished second to F.C. Porto. After helping the Bavarians to five leagues and three cups, Pflügler only managed 14 games in 1991–92, and decided to retire. However, a flood of injuries to the side in 1995 prompted a request by then manager Giovanni Trapattoni which the player accepted, appearing on 8 April, in a home game against 1. FC Kaiserslautern, where he was also booked; even more astonishingly, he spent the entire 2001–02 season with the club's amateurs in Regionalliga Süd, helping it to a final 10th place, aged 42. Pflügler played for the German national team on 11 occasions, making his debut on 25 March 1987 in a friendly game with Israel, and being selected for the squad at the following year's UEFA European Football Championship. Pflügler was also picked for the 1990 FIFA World Cup as Andreas Brehme's backup, playing 90 minutes against Colombia for the eventual champions. I know he's in Bayern Munich's first ALL STAR team squad , but I try to not fall in nostalgia while rating classic players , so honestly I don't see him more qualitative than a Marcel Jansen from the recent years , physically strong but nothing special in other things.